Creating an enlightened planetary civilization is an ambitious task, but not an impossible one. Great ambitions are seldom achieved without a plan. Here is a systematic step-by-step approach to creating an enlightened civilization. Learn to recognize the stages of developing a skill? Learn to conduct a successful presentation? Produce the sub-products that add up to a successful business? 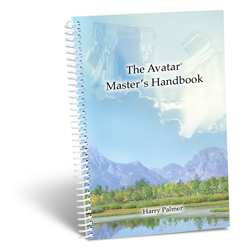 While this book specifically addresses the domain of the Avatar Master, you will quickly see that its lessons are principles with broad application to other enterprises. There are points in this book that far surpass what is out there on the marketing market. The Doingness Scale alone offers a way of self-evaluation and action that is sure to move us all forward. I have read and reread it and still find jewels imbedded in the writing. For an Avatar Master starting out, or anyone interested in conscious marketing, this book can help. Talk about a set of tools! The information in The Avatar Master’s Handbook feels so right. It’s a yes, yes, of course, yes thing. Here’s a confession. I am having a hard time finding an excuse to procrastinate any longer. I have all the tools that I need to reengineer my own consciousness. Contributing to the creation of an enlightened planetary civilization can take many forms. It does not necessarily mean that you quit your job and become a self-employed Avatar Master. That is only one option. Maybe you can do the most good by continuing what you are doing and using your influence to steer people toward greater care and tolerance. Maybe you can follow your profitable profession and deliver to an occasional student in your spare time or at a co-delivery with other Masters. Maybe you can partially or completely convert services you already deliver to Avatar courses. Maybe you can scale back working for others and transition into marketing and delivering Avatar with partners. Maybe you can affect legislation, media, or public opinion toward a more favorable environment for the planetary expansion of Avatar. Maybe you can add a little adventure to your retirement or spend your vacation doing something more productive than nursing a sunburn. What are your options? They are discovered by using a combination of personal experiences, imagination, and reason. Rate your options by the same criteria you rated your goals in the beginning of the Master Course. Exploring options is usually a 24- to 48-hour process. The advice to sleep on a proposal before you make a commitment is good advice. But finally, pick a direction or a plan of action and commit to it. Your commitment has power. It’s a stable point in a chaotic world. It’s a foundation for inspiring friendships. It is the power of your commitment that will determine your success or failure in any endeavor. Commitment is backing up your primary with action. Undertake something. Chinese, Dutch, French, German, Hebrew, Italian, Japanese, Korean, Portuguese, and Spanish.